Designed for the cooking enthusiast, Pascal brings a new level of convenience and safety to the kitchen. 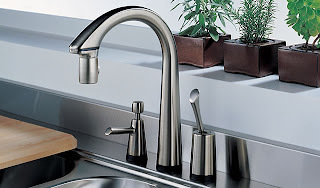 A built-in motion sensor provides hands-free functionality, allowing you to activate water flow without touching the faucet, while the touch-sensitive spout and handle with SmartTouch™ technology activates water flow with just a light touch - leading to efficiency of motion during food preparation and clean up. eFaucets.com is the leading online retailer of Faucets. We carry every BRIZO product and the fastest delivery of luxury Brizo faucets online. Free Ground Shipping on all orders over $99. Award winning site, large selection, low prices and excellent customer service. The Faucet leader. Why shop elsewhere?